With school coming to an end and a baby that's beginning to walk (and get fevers), I've fallen behind in reading the few books I have at my local shop. Always a champion of the indie-fare, I realized that my reading pile was a cross section of some of the cooler independent works available. 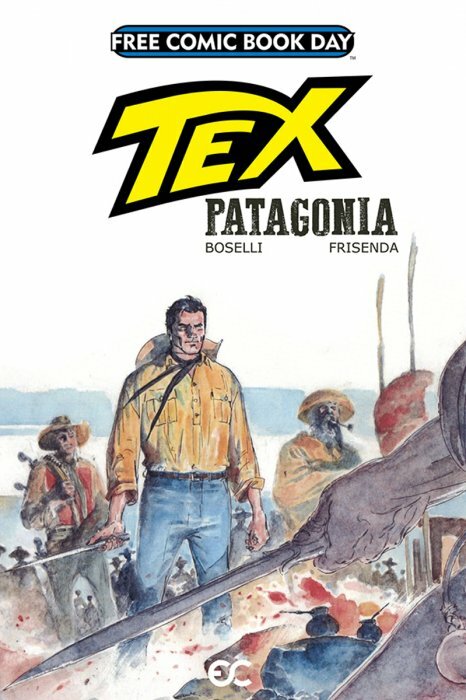 Created in the 1950s in Italy, and as much a part of their collective consciousness as Superman and Batman, Tex is a cowboy and social justice warrior, the father to a half Navajo boy and apparently the leader of the Navajo themselves, he seems to epitomize all of the romantic Old West ideals that appeal so keenly to Europeans. In this excerpt of the longer and black & white Tex: Patagonia, an American reader gets a glimpse of a world they never even conceive of: westward expansion of the white man (definitely familiar territory) in Argentina (???). We get Gauchos, cool non-American cowboy hats, and frank discussions between a half Navajo/half white kid and the general of the expeditionary forces about how the possible slaughter of native tribes may not sit so well with him and his father, the titular character of the tale. The general's response showed me the level of big-picture storytelling going on: (to paraphrase) "That I recognize some tribes are allies while others are not is why I have been sent." The only thing that remotely bothers me about this series---and books in general from Black Mask---is the release schedule. Tiny companies that are trying to exist on the margins by creating awesome niche or otherwise novel and original content should be better about getting their books out at regular intervals. I understand that Matthew Rosenberg's father has medical issues that pushed issue #3 back months, and that reset the entire series timeline. And I understand that tiny companies trying to exist on the margins must have an extraordinarily difficult time just staying afloat. Mad props. 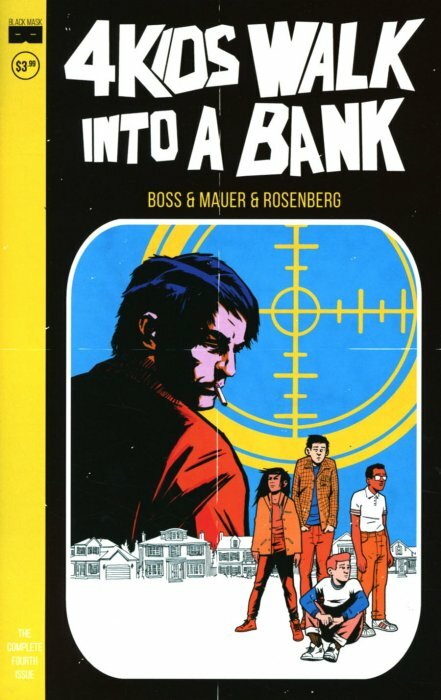 Anyway, the tale of Paige trying to save her dad from going to prison by teaming up with her friends to rob the same bank her dad and his idiot cronies are planing on robbing is starting to pay off, and with just a single issue to go, I can tell that the subdued yet fantastically quirky art and wild storyline are just going to leave me wanting more. I love the art: rough and raw, expressive and colorful, Kieth's passion flows from every panel. 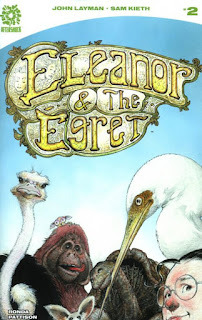 The story is just weird enough to grip me, and the plot thickened as we get the news of a connection between Anastasia Rue, the artist whose paintings Eleanor is stealing, and Eleanor herself. Also, it seems like everyone has a pet of some kind. 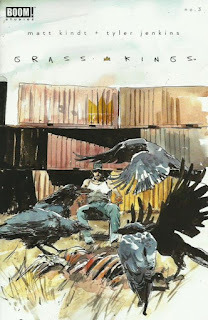 Jenkins's watercolors are beautiful and Kindt's story is paced like an episode of network television, but a half-hour show. It goes by so fast, leaving you thirsty for more, and not feeling like you've just read two dozen pages. The cover image from above is the gruesome climax to this issue: one of the sheriff's henchmen from the town across the lake---the Grass Kingdom's foe---has been killed and must be disposed of. Only it's too dangerous to weigh him down and sink him in the lake because that's the first place anyone would look. So these guys just drop the corpse behind some blockers, set up a guard, and let the scavengers have at him. There is some really good work being done at the moment in the industry, and I'm glad to be able to enjoy it. Look at these titles. 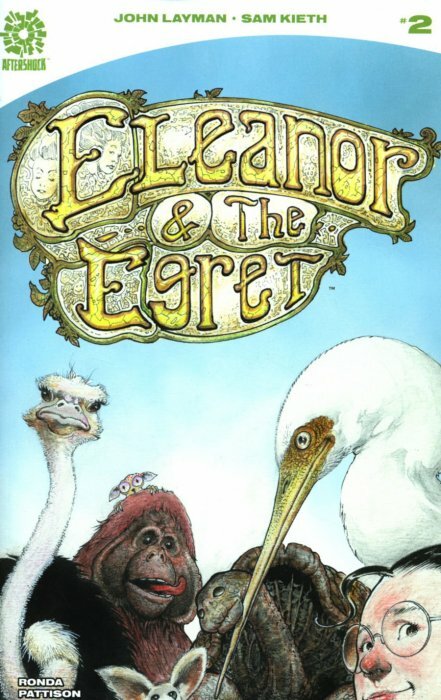 Four books: one excerpt of a graphic novel, two miniseries, and one ongoing title, and nary a superpowered character anywhere in sight...unless we're counting the talking egret Ellis, I suppose.